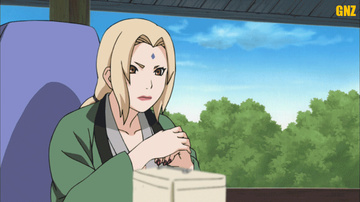 Hotaru is a full-figured girl with dark-green eyes, a widow's peak, and mid-back length dark blonde hair. She wears a light-violet and white top, black shorts, a black skirt, black high boots and light violet wristbands. She is rather short, as shown when standing in front of Naruto.